Every day, I come into the Jalopnik office, open my laptop and blog the blogs. 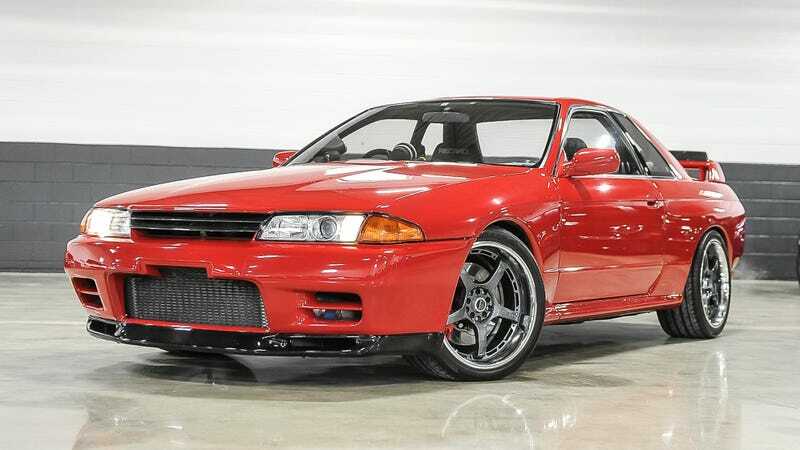 I also have a separate window always open and one eye trained on my TweetDeck, which is how I saw this lovely red 1990 Nissan Skyline GT-R pop up on Bring a Trailer. I think its shininess is what first caught my attention. I mean, just look at it! Glossy and in that shade of perfect firetruck red that’ll surely alert every cop within a 30-mile radius. Right-hand drive, too. It honestly looks like the perfect Skyline. But wait up, what’s this? An aftermarket tailpipe? I felt my heart sink. The car is too modified for my own tastes. Let me be clear, I’m not against modified Skylines. I just wouldn’t want someone else’s modified Skyline. Maybe somebody else out there—someone braver, no doubt—will want this red Skyline. Maybe that someone is you. At the time of this writing, the current bid is up to $2,500. You can do it! Buy it and tell me if it’s actually this shiny in person. Do me one favor though: Change those wheels.